» A “bottle bill” redemption center? Make it quick! The former thrift store on Santiam Road. 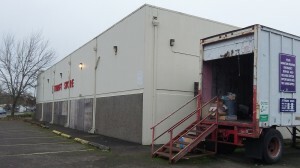 The Salvation Army still operates a donation trailer there. If you’re tired of having to wait your turn at the bottle-return stations of Albany supermarkets, you will welcome a proposal to establish a central redemption center of the kind already operating elsewhere in Oregon. The Salvation Army has asked the city to allow a “bottle bill” recycling center at the former and long-vacant Salvation Army thrift store at 1224 Santiam Road S.E., a property which has not found a buyer for six years. The Oregon Beverage Recycling Cooperative would like to remodel the boarded-up building as a redemption center open seven days a week and staffed from 9 to 6. Operation of the center would enable retailers within two miles — only Wal-Mart is outside that radius, the planning commission was told — to close their own recycling devices. Customers could take their empties to the center to be counted either automatically or by staff, or they could arrange for “premier service,” which allows customers to drop off a bar-coded bag for a credit on the customer’s card to be redeemed at area stores. I like this idea. We have a team that recycles bottles and cans at South Albany High School and I am tired of feeding them into the holes one by one. We plan on buying an i-pad for one of the school programs with the monies collected. How are the expenses paid to operate this “recycling center”? A surcharge on our redeemed cans/bottles? Personally, having to walk an extra mile to redeem my containers ISN’T appealing to me.